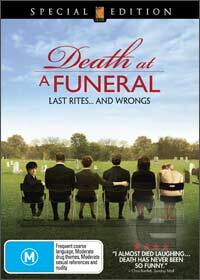 This entertaining British comedy is probably one of the funniest movies about death and when the patriarch of a family passes away, a Pandora's box of secrets are revealed. Directed by the talented Frank Oz, he puts together a strong cast of actors who help push this movie across the line from average to entertaining. From the very first moments of the film, the viewer knows that something is wrong and when son Daniel (Matthew Macfadyen) attempts to honour his father's wishes, ne needs to juggle the promise he made to his wife of buying an apartment, his overthetop novelist brother Robert (Rupert Graves) who everybody adores and the like and that of the funeral. To compound the situation, a mysterious dwarf (Peter Dinklage) arrives at the wedding and decides to blackmail the family in stopping him to reveal one of the family's most darkest secrets. It doesn't end there for Robert as his cousin Martha (Daisy Donovan) and her husband to be Simon (Alan Tudyk) who is trying to make an impression for her father accidentally takes an illicit drug and behaves in some extremely hilarious and entertaining ways. Death at a funeral is classic British comedy at its best that can be watched be a variety of people without offending too much. However the toilet seen is easily one of the most disgusting scenes in the movie, so be warned, the movie is not what you'll expect!